What makes a great cookie or cupcake special? Sprinkles Elevate your service from value-added to value-unique with "Sprinkles," by bestselling author Chip R. Bell. This amazing little book is full of compelling stories, breathtaking insights, and super-cool techniques that will provide you with the perfect recipe for how to attract and retain the loyalty of today's picky, fickle, and vocal customers. 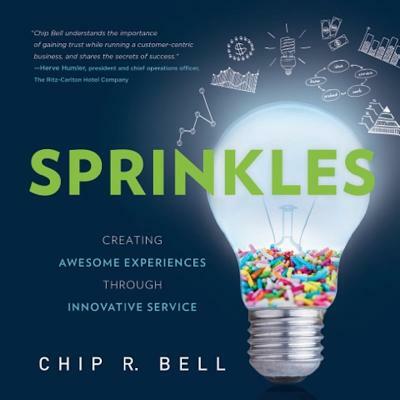 The author of 21 books, Chip's newest book is "Sprinkles: Creating Awesome Experiences Through Innovative Service." He is also the author of such bestsellers as "The 9 1/2 Principles of Innovative Service," "Take Their Breath Away" (with John Patterson), "Managers As Mentors: Building Partnerships for Learning" (with Marshall Goldsmith), "Service Magic" and "Managing Knock Your Socks Off Service" (with Ron Zemke). He has served as consultant, trainer or keynote speaker to such major organizations as GE, Microsoft, Nationwide, Marriott, Lockheed-Martin, Cadillac, KeyBank, Ritz-Carlton Hotels, Caterpillar, Eli Lilly, Verizon Wireless, USAA, Merrill Lynch, Hertz, Accenture, Home Depot, Harley-Davidson and Victoria's Secret. Global Gurus ranked him in 2014 the #1 keynote speaker in the world on customer service. The Chip Bell Group was in 2014 ranked #6 in North America among mid-sized consulting firms for leadership development. He was a highly decorated infantry unit commander in Vietnam with the elite 82nd Airborne and served as a guerrilla tactics instructor at the Army Infantry School. He has appeared live on CNBC, CNN, Fox Business Network, Bloomberg TV, NPR, ABC and his work has been featured in Fortune, Business Week, Forbes, Wall Street Journal, USA Today, Inc. Magazine, Entrepreneur Magazine, CEO Magazine, WSJ MarketWatch, Leader to Leader and Fast Company.